Approximately 10,000 years ago, a violently explosive eruption evacuated about 30 km³ of molten rock from Deception Island. The volcano summit collapsed to form the Port Foster caldera. The volcano was particularly active during the 18th and 19th centuries. 20th century eruptions occurred during two short periods, between 1906-1910 and 1967-1970. In 1992, enhanced seismic activity on Deception Island was accompanied by ground deformation and increased water temperatures. Today, the floor of Port Foster is rising rapidly in geological terms, and there are areas of long term geothermal activity. It is classified as a restless caldera with a significant volcanic risk. GREEN - No eruption is anticipated. Volcano is quiet, in dormant state. Normal seismicity and fumarolic activity occurring. This is the normal alert state for Deception Island. YELLOW - An eruption is possible in the next few weeks and may occur with little or no additional warning. Volcano is restless; an eruption may occur. Increased levels of small earthquakes detected locally and/or increased volcanic gas emissions. ORANGE - Explosive eruption occurring or is possible within a few days and may occur with little or no warning. Ash plume(s) not expected to reach 10,000m above sea level. Volcano in eruption, or eruption may occur at any time. Increased numbers and/or magnitudes of local earthquakes. Extrusion of lava flows (non-explosive eruption) may be occurring. RED - Major explosive eruption is in progress or expected within 24 hours. Large ash plume(s) expected to exceed 10,000m above sea level. 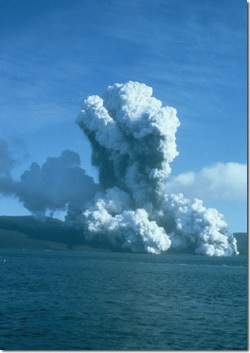 Significant eruption is occurring or major explosive activity expected at any time. Strong earthquake activity detected even at distant monitoring stations. The full Alert Scheme and Escape Strategy can be accessed here.